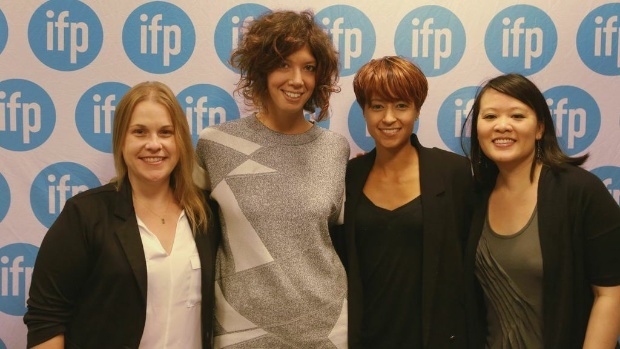 Left to right: Rebecca Green, Elisabeth Holm, Lisa Biagiotti and Mynette Louie at the IFP Filmmaker Conference. The day’s workshop included speakers covering crowdfunding, new forms of distribution, DIY theatrical and more. Here are the highlights from a day skillfully moderated by Sundance Artist Services’ Joe Beyer and Chris Horton. Inspire local pride. 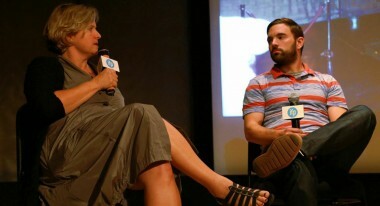 Schoenbrun mentioned the film Rich Hill, which used as its Kickstarter tagline, “People still live here.” By marrying the themes of the film to the pride of their local community, the filmmakers not only succeeded at their campaign but built an audience that supported the film in later stages. You can use both Kickstarter and Indiegogo. For Blood Brother, Yourd said he campaigned on both platforms, using the latter, which allows you to keep money raised even if a goal is not hit, to fundraise for a festival publicist, knowing that the filmmakers would cover any shortfall. Do email blasts. The importance of email lists was stressed throughout the day. For Gennadiy, a film set in the Ukraine, the filmmakers targeted Ukrainian organizations, social clubs and other organizations. Beware of assuming that you can reach your audience just via social media. “Tweets are not always seen,” reminded Schoenbrun. Keep a campaign short. 25 to 30 days seems to be the sweet spot. “Longer can drag,” said Schoenbrun. Divide and conquer your audiences. Your film has multiple audiences. Successful campaigns know how to focus and deliver each one. Schoenbrun spoke of the James Randi documentary, An Honest Liar, for which social media strategists Film Presence divided the campaign into weekly segments. One week they’d target the magician community, the next LGBT. In short, filmmakers can package portions of their films — deleted scenes, marketing materials, or other content — and distribute them to the predominantly young, tech-savvy audience that uses BitTorrent. Charles, for example, was able to use the service to drive traffic to the crowdfunding campaign for his film Mythical Creatures: “They were able to tap into independent film world, and we didn’t have to pay $10,000 to a PR person or take out ads. [BitTorrent] drove 61% of our Kickstarter traffic. The takeway here: for the right project, consider BitTorrent bundles. It’s not just about money. Working with a brand is not just about production funds, Reiss and Newman reminded. Outreach and awareness building are even more valuable. Newman spoke of the huge effort Patagonia put into publicizing and even distributing in its stores the doc Dam Nation. Possibly the most fearsome word in the independent film lexicon got its own section of the workshop. There was a lot of solid advice and technical information here, but I’ll just leave you with a few thoughts from Emily Eddey of Light Iron. Budget for deliverables. Eddey broke it down on stage, but, in ballpark numbers, she said technical deliverables for a domestic digital release generally total around $25,000. For a festival release, budget $8,000. Plan on a DCP. “A DCP is now the standard deliverable,” she said. That will run you anywhere from $500 to $4,500 — and beware of vendors competing on the lower end of that scale. A Pro Res master will cost between $500 and $1,000, and that old (but still used) format of HDCAM/SR will run about $700 to $1,500 to output and master. Don’t encrypt! If you make a DCP, you will be tempted to play like the studios and encrypt your film. However, everyone on this panel cautioned against that. Eddey pointed out that you need a separate encryption key for every theater, which means that for some festivals, you’ll need multiple keys for your film. And you may limit the festival’s ability to switch screenings or add a screening on the fly. Everyone felt the piracy concern was minimal compared to these possibilities. Negotiate your distribution requirements. Before making a deal, look at your distributor’s deliverables list. Budget it out, make sure you can comply with it, and try to negotiate out excessive items. Paid rough-cut screenings. While the film was in post, she booked theaters to screen rough cuts of the film, selling tickets and making audience members feel as if they were part of the film’s shaping. Use extra footage to develop audience and for crowdfunding rewards. “What people wanted was videos,” said Smith of her fans during the film’s production and post-production process. “We put out tons and tons of little videos and get volunteers to cut them together. We had both a six-minute trailer and a 23-minute trailer, which they could see for $25 donation. Leverage festival play into local distribution. Walking the Camino had a “double premiere” at Ashland and AmDocs, and Smith used the former to launch an unexpected six-week run of the movie. By selling out two festival screenings, she demonstrated a strong local audience for the film and then went back to Ashland where a local theater ran the film for six weeks. Building and Selling from a Website. Deepen the Relationship. Once your film is out in the world, think of ways you can deep the relationship with the fan base you have built. What else can you do with your movie, asked Wilkinson? Keep the conversation going. Run flash sales. “Flash sales” — where you suddenly discount and promote a film for a short period — “work every time,” said Wilkinson. “But attaching a time limit is essential.” And look for news events that would add logic to a flash sale, and be creative with your coupon code. Wilkinson cited the example of Minecraft: The Story of Mojang, which ran a flash sale with an irreverent coupon code following the game’s sale to Microsoft. Create deluxe editions (and save your unused content). Your content doesn’t need to be priced cheaper and cheaper as it moves through the distribution chain, said Wilkinson. “You can create a digital equivalent of a deluxe Blu-Ray.” As an example, check out the VHX page for Stripped, which offers several different deluxe editions, including a fully-loaded $65 version with hours and hours of additional content. For producer Mynette Louie, it was “the devaluation of content.” “The audience doesn’t see the value [in a movie],” she said, when there are so many other, often free media products vying for their attention. The second biggest problem: sustainability. Green’s answer was echoed Deepsouth director Lisa Biagotti, who also spoke of producer mission creep. “Every time I think I’m done there is another producing role that I have to have, which is now ‘impact producer.’” she said. What single piece of advice would these producers give that would help someone else? Get them to say no, said Louie, quoting James Schamus by way of me. Schamus gave me this advice years ago, and while it’s counterintuitive, ignore it at your own peril. Too often you’ll try to get a financier to say “yes,” and you’ll do meeting after meeting, and you’ll wait month after month. But “yes”‘s often come quickly, and people in the industry often hate to say “no.” Don’t waste time in relationships that won’t end in anything concrete. Get them to say no and move on.